Some historical context: Stahl influenced Dutchman Abraham Kuyper via Kuyper's mentor, Guillaume Groen Van Prinsterer. 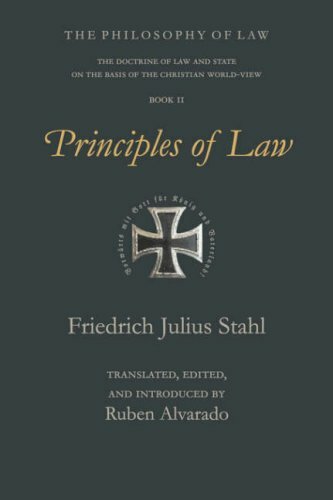 As a committed Lutheran and legal philosopher active in Germany in the middle of the 19th century, Stahl occupied a space between a revolutionary Liberalism and a paleo-conservative Christian revanchism. He appreciated Liberalism's respect for the individual but not its rejection of a divinely ordered social reality. In other words, he believed in subjective rights (contra Oliver O'Donovan) and an objective right order (contra Nicholas Wolterstorff). What is the solution to the problem of justice if neither right order nor subjective rights are free from deforming effects? Of little surprise to those who know my work I believe the answer is in a principled combination of the two accounts of justice. ... On my typical three-fold platform of normative, situational, and existential, the latter two perspectives would encompass right-order and subjective rights. For now the third perspective on justice eludes me but I hope to work it out soon. In other words, the fear of God is what unites the competing accounts of justice--subjective rights and right order. The fear of God entails a "fear" for individuals created in His image. And the fear of God justifies a "right" social and political order that provides a framework within which the rights of those image bearers can subsist.